"It then occurred to me that perhaps what I was searching for in my own quest for taste was some sort of adulthood. It was a startling idea. The quest for taste might be nothing more than a voyage out of childhood. In the case of wine, it was surely a pilgrimage away from the sweetness of mother's milk and toward the 'unnatural' tastes of perverted (but sublime) old age! From sweetness to dryness; from simplicity to complexity; from certainty to ambiguity." Wine by its very nature is a purposefully exclusive culture. The words used to describe every part of its creation alone constitute a sort of second language, one that isn't meant to be understood by the unwashed masses. The need for this kind of esoteric aura is clear from a financial standpoint if nothing else: It's just fermented grape juice after all. Anyone who would ask a consumer to pay hundreds or even thousands of dollars per bottle with a straight face needs this to be true. 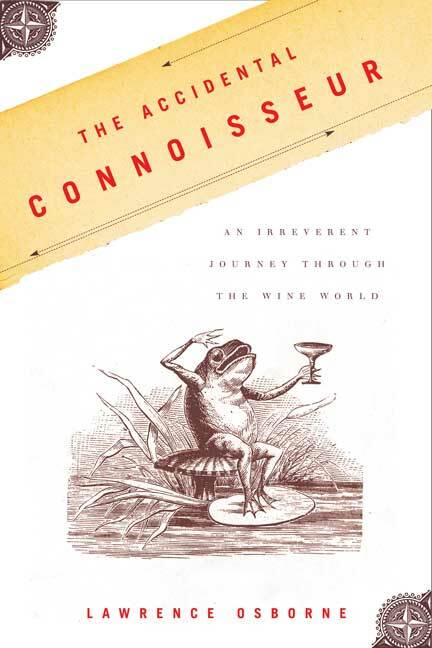 Osborne's book, The Accidental Connoisseur, is meant to be a counterpoint towards this notion. He's not a wine writer by trade. As a wine lover though, he does possess a canny understanding of how the industry has developed over the last few decades. His travels take him from Italy to California to France and back to Italy again. His only destination, as outlined in the excerpt quoted above, is the refinement of his own taste. This mythical idea is what the wine world lives and dies by. For example, noted wine critic Robert Parker, who created the 100-point scale which revolutionized wine industry, has insured his sense of smell for $1 million. A winemaker can spend months and years toiling over the varietals, the terroir and every other aspect of their product, only to be laid to waste in a matter of 30 seconds by Parker's nose. Readers who aren't familiar with wine culture, Romance languages and European geography are at a disadvantage with this book. Osborne assumes a prerequisite knowledge of at least a little of all three subjects and breezes past obscure references without a second thought. More than once I found myself scanning entire blocks of text with my eyes, only to find that when it came time to turn the page that I had little to no idea what I had just read. Still, Osborne is frequently a funny and adroit author who has the ability to draw vivid portraits of the personalities he encounters including the aforementioned Parker and California wine baron Robert Mondavi. (Here's some free advice: never mention Mondavi to a European winemaker. You may not make it out alive.) His worldwide travels offer a global perspective on what was once the hallmark of local culture. "As I see it, the great power of the Americans comes from their having no relation to their own land," French New Wave director Jean-Luc Godard is quoted as saying. "No relation to anything. They float in a void. Globalization, so called, is just an irrational spurning of history." Indeed Americans (and especially Californians) receive much of the blame for the mechanization and commercialization of wine by the Europeans interviewed by Osborne. However, this does not stop them from attempting to cater to our tastes as 75,000 different wines make up what is now a $50 billion per year industry. If nothing else, The Accidental Connoisseur proves that if taste, refinement and history can't be bought, someone forgot to tell the scientists at the UC Davis School of Viticulture and Enology.